Italian designers Formafantasma have completed a series of objects using various types of discarded leather, including the skin of pigs, fish and cork trees. Pieces in the collection include fish-skin hot water bottles, boar-fur brushes and water containers made of cow bladders. 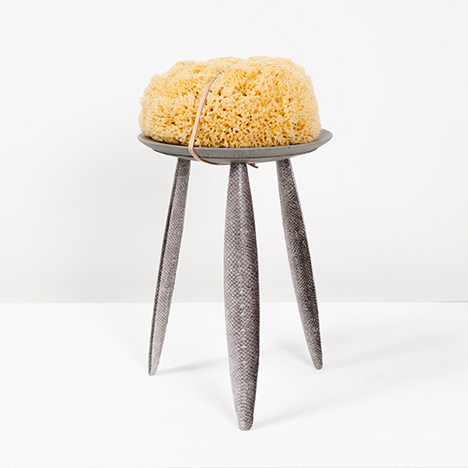 Above: Salmon stool: Fendi discarded leather, vegetal tanned salmon skin, wood, sea sponge. For the first time, FENDI is bringing its Design Performance program to Design Miami/ Basel, expanding on the program’s successful ventures in Miami and Milan. Since 2009, the FENDI Design Performances have offered audiences a rare view into designers’ workshops through the use of FENDI discarded materials and live demonstrations of the processes by which exceptional craft-based design work is made. In line with their previous presentations ‘Craft-Punk’ and ‘Craft Alchemy’, for this year’s project, FENDI has invited Italian design studio Formafantasma to develop ‘CRAFTICA’, a new body of work exploring leathercraft in conversation with other hand-worked, natural materials. Designers Andrea Trimarchi and Simone Farresin of Formafantasma were selected for this project because the young studio has already displayed an exceptional gift for inventive material investigations, as well as a highly refined and seductive aesthetic sensibility. Leather as a material has the ability to evoke almost ancestral memories of when nature was hunted to produce food, tools and protection for the body. Searching underneath and above the sea, from the vegetal to the animal world, the installation offers a holistic view on leather as a material. Despite the pieces appearing exotic in texture and material combinations, the majority of the leather and material used belongs to the daily. Above: Wolffish hot water bag: Vegetal tanned wolffish skin, glass, brass. The leathers have been paired with marble, oxidized metal, glass, wood and other unprocessed natural materials such as bones, shells and a sponge cultivated in a sea-farm as a substitute for industrial foam. The installation displays a large variety of objects ranging from tools to furniture: a collection of glass lights hung via belts and hooks; a table and room divider produced from vegetal tanned rawhide stretched over brass structures with marble weights; a series of four stools characterized by organic forms and fin-like legs upholstered in fish leather (salmon, perch, trout, wolffish); spoons and protective masks made with scallop-shells; and, jar-like containers in glass and cow bladders. As homage to leather, 28 handmade drawings are displayed on parchment (a strong paper obtained by a complex processing of hairless goat skin) portraying the many uses of leather throughout history. Drawings developed in collaboration with designer and illustrator, Francesco Zorzi. Photos by Luisa Zanzani.